The South Fork of the American River is everyone’s favorite California river! As the river flows through the heart of Gold Country, it includes rapids which are challenging yet not extreme. There is plenty of time for you and your rafting companions to indulge in family or group bonding, playful joke telling, and spirited water fighting. In-between the rapids, there’s always a little time for a refreshing swim in the cool, clear water. The South Fork’s long season and its close proximity to Sacramento, Lake Tahoe, Yosemite and the San Francisco Bay Area make this an extremely accessible river trip. The Chili Bar half-day trip is named after a population of Chileans who settled on the South Fork of the American during the California Gold Rush; the trip is short and sweet, with plenty of adventure for both novice and experienced rafters! The South Fork’s exciting Class III whitewater is near-perfect fun for the whole family! The water on the South Fork is released during summer months from hydroelectric facilities located upstream. Such water releases are not subject to the control of El Dorado County or commercial rafting companies. To increase your safety, we expect everyone to watch our 23-minute Whitewater Orientation video before joining us. Watch at www.oars.com/experience/safety/ or call 800-346-6277 to request a free DVD. Please don’t leave home without watching. We meet near our camp store at the OARS American River Outpost at 9:00 AM. Roads around here are winding, so please be sure to allow for plenty of travel time. Our river-side campground and base of operations is in the heart of the twin towns of Lotus and Coloma. Our peaceful hideaway is surrounded by plenty of history, recreational opportunities and cultural activities. Once everyone has arrived, the guides will deliver an orientation and safety talk and fit you with your safety gear. We will then take a 25-minute shuttle ride to the Chili Bar put-in point, where your boats and the rest of your OARS crew await. After practicing your paddle strokes with your guide, we will head downriver to the infamous rapid named Meatgrinder! Beautiful river scenes stretch out around us with redtail hawks soaring overhead and the occasional river otter swimming near shore. Exciting rapids like Racehorse Bend, Maya and Triple Threat await us on this enjoyable run! After a short section of class I-II whitewater, we find ourselves at the notorious “Troublemaker” rapid. This solid, class III rapid packs an exhilarating ride. Be sure to smile as we make our way through this rapid as there are often onlookers watching from the shore. After floating by the historic town of Coloma and the Marshall Gold Discovery State Historic Park, where gold was originally discovered in 1848, your trip begins to wind down—but not without a few more stories from your personable and knowledgeable guide. Once we return to the campground, we encourage you to stick around awhile: explore our nature trails, play campground games or just savor your time along the river. 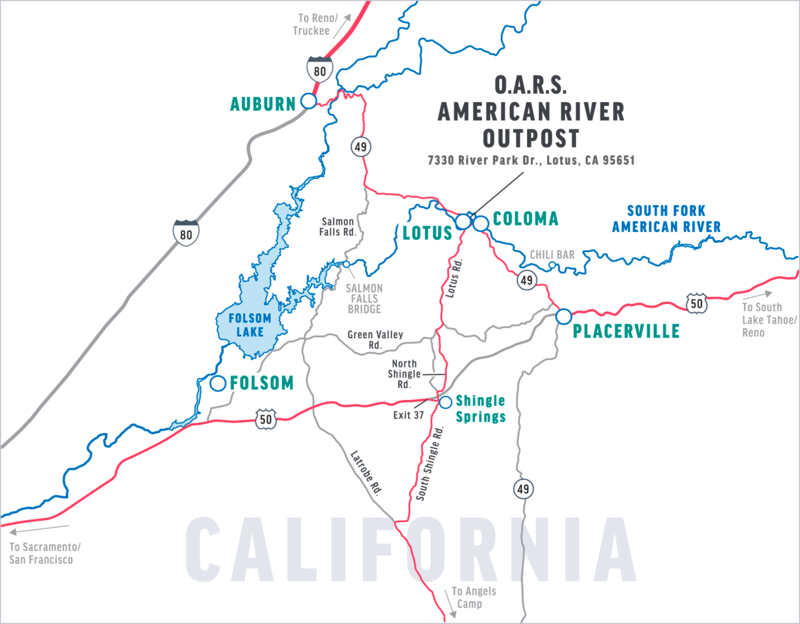 We’ll meet you near our camp store at 9:00 AM at the OARS American River Outpost, located at 7330 River Park Drive, behind Hotshot Imaging’s store in Lotus. Click here for a Google Map. From Sacramento on U.S. Hwy 50: Follow Hwy 50 east toward Placerville and South Lake Tahoe. Take the Ponderosa Road exit (Exit #37), turn left onto Ponderosa/S. Shingle Road and cross over the freeway. At the second stop light, take the right turn on N. Shingle Rd toward Coloma/Lotus. After about 4.5 miles N. Shingle Road turns into Lotus Road—continue going straight for about 6 more miles. As you approach Lotus, pass through the town’s first stop sign and continue to the 3-way stop sign intersection with Hwy 49. Turn left onto Hwy 49 (north) and cross the bridge over the South Fork of the American. Immediately after crossing the river, you will see the “River Park” shopping center on the left, with signs for Hotshot Imaging. Please use the center’s second entrance, where a left-turn lane is provided at River Park Drive. Look to the back of the center, where you will see the entrance to our American River Outpost. From South Lake Tahoe: Take Hwy 50 west to Placerville. Turn right on Hwy 49 (north) and follow the directions from Placerville listed below. From Placerville: Proceed north on winding Hwy 49 for about 9.5 miles (about 20—25 minutes) through the town of Coloma. Just past Coloma and the Marshall Gold Discovery State Historic Park, cross the bridge over the South Fork of the American. Right after crossing the river, you will see the “River Park” shopping center on the left, with signs for Hotshot Imaging. Please use the center’s second entrance, where a left-turn lane is provided at River Park Drive. Look to the back of the center, where you will see the entrance to our campground. From Reno/North Lake Tahoe: Take Interstate 80 west to Auburn. Take Hwy 49 south from Auburn for about 17 miles (about 30 minutes), arriving in the Coloma/Lotus area. After passing through Lotus’ 3-way stop sign (intersection with Marshall Grade Road), continue past the gas station and look for us behind the “River Park” shopping center on the right. Before Hotshot Imaging’s building, turn right onto River Park Drive and look for the entrance to our campground in the back of the retail center. The closest major airport is in Sacramento (SMF), which is served by most major airlines and car rental companies. Oakland (OAK), San Francisco (SFO) and Reno (RNO) are within a 3-hour drive. 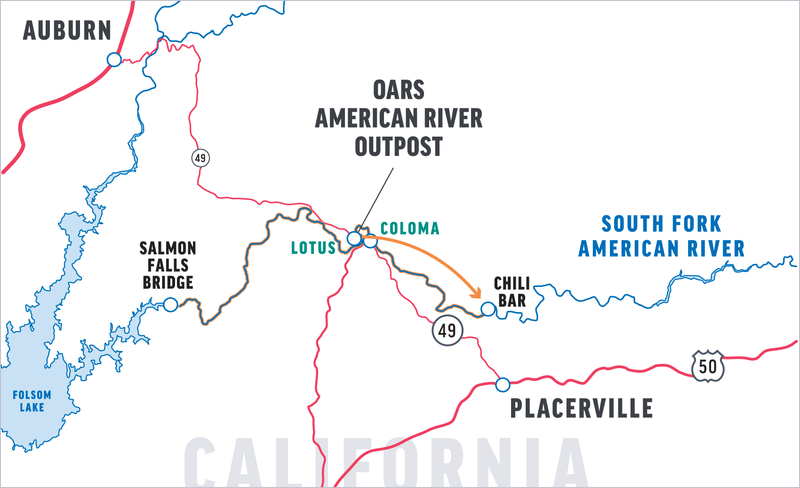 One night of FREE camping before or after your trip is available at the OARS American River Outpost in Lotus for everyone who goes rafting with us; additional nights of camping and all nights of camping for non-rafters are $10 per person/night. Advance reservations are required. Please ask an Adventure Consultant about the details of staying at our beautiful riverside camp or click here. We recommend you make reservations well in advance in order to guarantee lodging. You may want to check one week prior to your trip for an up-to-date weather forecast. We recommend you check the following web sites for weather in Coloma, CA: www.weather.com or www.accuweather.com. Ability to remain seated and balanced while in a whitewater craft while holding on with at least one hand. Wear a Type V Coast Guard-approved personal floatation device (maximum chest size of 56 inches). Wearing leg straps may be required to ensure proper fit. Where required, properly wear a helmet. Ability to independently board and disembark a boat four to ten times each day. This may require stepping into the boat, and then maneuvering your body over and across tubes and fixed objects into a seated position. Ability to independently navigate shoreline terrain, including safely maneuvering around and across boulders, rocks, and slippery and uneven surfaces, under low branches, and around vegetation. This includes the ability to maintain your balance near precipitous ledges or cliffs. Ability to independently swim in whitewater or swift currents while wearing a PFD. This includes being an active participant in your own rescue, including having the ability to (a) keep your airway passages sealed while underwater, and regain control of your breathing when being submitted to repeated submersion under waves or currents; (b) orient yourself to new “in-river” surroundings; (c) reposition yourself in the water to different swimming positions; (d) swim aggressively to a boat or to shore in whitewater; (e) receive a rescue rope, paddle, or human assistance, and possibly let go of the same; (f) get out from under an overturned boat. Ability to swim 100 yards in flat water while wearing a PFD. Ability to assist another passenger who has fallen out of the boat by pulling them back in. It is very important that each trip participant take an active role in their own safety. You will likely encounter wilderness conditions that you are unfamiliar with, and those conditions may change rapidly. It is critical to pay attention at all times, to be aware of your surroundings, and to avoid taking unnecessary risks. Even a non-life threatening injury in a wilderness setting can become a major emergency for you, and can endanger the entire group. Swimming alone or hiking alone is discouraged. Excessive alcohol consumption or illicit drug use is not tolerated. Using common sense, and following both the explicit instruction and the lead of your guides can go a long way towards keeping yourself and the group safe. Some obvious things to avoid in camp and on shore (by way of example) are: walking around without shoes in camp, approaching wild animals, not paying attention to what is above or around your tent site that could harm you, not paying attention to hazards such as poison ivy and rattlesnakes, and walking near precipitous ledges. The best choice is an amphibious shoe that drains water, protects your toes and won’t come off in swirling current. A retired pair of athletic shoes can work well, too. Sport sandals with a heel strap are a good option. Find professional-grade options made by Chaco®, the official footwear sponsor of OARS guides. We recommend starting with bathing suit/swim trunks and a lightweight synthetic shirt, and then adding layers of synthetic long underwear and fleece as needed. Protecting yourself from the sun should be taken very seriously! A hat, sunscreen, lip balm and sunglasses are a must. In many cases, a long-sleeve shirt is the best method for preventing sunburn on your upper body. Light-weight long pants may also be appropriate to protect your legs. ALWAYS BE PREPARED FOR CHANGING WEATHER! Especially during the months of April, May and early June, California can experience extreme changes in weather. Wearing cotton items on a river trip is only appropriate when the weather is hot. Wet cotton will chill your body temperature. Provided (early-season) wetsuits do not include “wetsuit booties” – please bring your own, or wear wool socks with tennis shoes as a good alternative. Please let us know if you have any medical issues we will need to consider in planning your trip. No dogs are allowed at the OARS American River Outpost. You may want to bring a small waterproof bag to hold your camera and other items you might need during the day. While most rafting-specific bags are designed to be waterproof, you may also wish to place your camera in a durable, waterproof casing for additional protection. Disposable waterproof and panorama cameras are also a fun option. There are several professional companies taking photos of each raft at some of the South Fork’s larger rapids, which provide great action shots. These companies are not affiliated with OARS and you will need to contact them separately to purchase these pictures. Hotshot Imaging is conveniently based in Lotus right next door to our campground; visit them after your South Fork of the American trip at their storefront on Hwy 49 to order pictures. (To order your photos online, you must request the photo link for your trip from Hotshot Imaging.) For more information, visit http://www.hotshotimaging.com/ or call (530) 621-0400. Each participant will need to complete the required trip forms online and submit them no later than 30 days prior to your trip, or immediately if booking within 30 days. Final and full payment is due at the time of booking. We advise that you leave your valuables at home or in your private vehicle and take on the river only what’s absolutely necessary. We also recommend you leave dry shoes and clothing in your car to ensure a comfortable drive home. Tipping is optional, but appreciated by our staff. If you are wondering how much to tip, you may consider that we operate in a service industry with a host of behind-the-scenes contributors in addition to the guides on your trip. In general, we suggest a gratuity based on 10 – 15% of the trip cost. It is customary on OARS trips for gratuities to be given to the Trip Leader in the form of cash or personal check, who will then distribute appropriately amongst all the guides and support staff. In reviewing your statement, you’ll notice a $1/person/day donation to the American River Conservancy, a non-profit organization dedicated to protecting the Forks of the American River. One-hundred percent of your tax-deductible donation goes toward conserving the American Rivers watershed. This donation is voluntary and may be removed from your invoice if you choose not to participate. Full payment is required at the time of booking. Payments may be made by check, money order or Visa/Mastercard (American Express and Discover incur a 3% processing fee). Receipt of the payment signifies acceptance of our complete Terms and Conditions. Individual departures and trip capacity are strictly limited by the managing agency. Cancelling your trip will incur cancellation fees because holding spots for you means we are likely turning others away who would like to book the trip. If you find it necessary to cancel your trip, please notify us as soon as possible. We do not make exceptions to the cancellation policy for any reason, including weather, wildfire, terrorism, civil unrest or personal emergencies. There is no refund for arriving late or leaving a trip early. 29 to 3 days prior Payment can be transferred to another trip (within the same year) for $15/person transfer fee. No refund. Please note that different deposit/cancellation policies may apply for charter groups. Refer to the group organizer’s confirmation e-mail for details. Under most circumstances, if you are of an adventurous spirit and in reasonably good health, you should have no problem enjoying an OARS trip. People with medical conditions, including pregnancy, should have a physician’s approval before taking an adventure travel trip. Everyone is required to sign a standard liability release form before the trip, acknowledging awareness that there are inherent risks associated with the trip. Due to the nature of the activities, a condition of your participation is that you will sign this form and return it to our office before the trip begins. Anyone who refuses to sign the form will not be allowed to participate, and consistent with OARS cancellation policy, there will be no refund of the trip fees at that time. O.A.R.S. West, Inc. and cooperating agencies act only in the capacity of agent for the participants in all matters relating to transportation and/or all other related travel services, and assume no responsibility however caused for injury, loss or damage to person or property in connection with any service, including but not limited to that resulting directly or indirectly from acts of God, detention, annoyance, delays and expenses arising from quarantine, strikes, theft, pilferage, force majeure, failure of any means of conveyance to arrive or depart as scheduled, civil disturbances, government restrictions or regulations, and discrepancies or change in transit over which it has no control. Reasonable changes in itinerary may be made where deemed advisable for the comfort and well being of the participants, including cancellation due to water fluctuation, insufficient bookings (this trip requires a minimum of 4 guests), and other factors. There is risk in whitewater rafting, particularly during high-water conditions. Rafts and kayaks can capsize. You could be swept overboard. Your guide will make every attempt to assist, but you must be strong and agile enough to “self-help” and “float-it-out” without further endangering yourself or others. We reserve the right not to accept passengers weighing more than 260 pounds or with a waist/chest size exceeding 56 inches. We may decide, at any time, to exclude any person or group for any reason we feel is related to the safety of our trips. We are experienced at accommodating people with various disabilities. Please give us an opportunity to make you feel welcome. We need to discuss any special requirements ahead of time. On advancement of deposit the depositor agrees to be bound by the above recited terms and conditions. Prices subject to change without notice.